five × 6 = Required Please enter the correct value. This past March, I asked a highly successful investment advisor what he thought about gold. Since he deals almost exclusively with very high net-worth individuals, his point of view was especially intriguing. 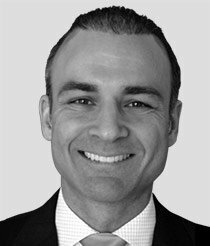 He confided to me that many of his clients had been asking for gold and gold-related investments over the past few years. I can't say that I was surprised. But what he told me next simply shocked me. "Gold's much too volatile, it's too risky", he said. "Sure it's up, but I try to discourage my clients from investing in it." It simply floored me that he thought gold was too volatile. Gold is only up 580% since it bottomed in 2001, without a single losing year to date. That's not something you can say about the stock market or any other type of investment. I can hardly imagine what he must think of silver, as silver prices are up by 725% since 2001. Today, silver is trading around $34, but our 2013 silver price forecast now has the shiny metal going much, much higher. What will power that rise? Since it's slaved to its richer cousin, all the fundamentals for higher gold would apply. I wrote about them yesterday in my 2013 gold price forecast. As history has shown, silver moves almost in sync with gold, but exaggerates its movements, both on the up and down sides. That's why I like to think of silver as "gold on steroids". For 2013 I think silver, like gold, will set a new all-time nominal price record, likely reaching as high as $54 an ounce. Despite silver's dependency on gold, it does have some distinct fundamentals, too. The Gold/Silver Ratio: Before the financial crisis, the gold/silver ratio was around 50 (meaning an ounce of gold would buy you 50 ounces of silver) and trending downward. In late April last year silver exploded higher, pushing the ratio down below 30. That was short-lived, as silver's dramatic rise was unsustainable. I had said so at the time. The ratio recently returned to a high level near 60. 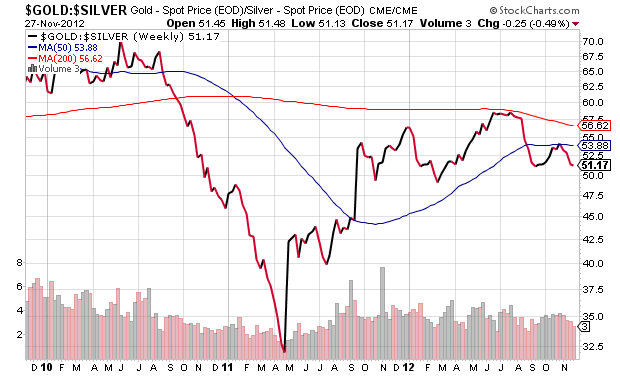 In 2013, look for the ratio to head back down again, meaning silver will rise faster than gold. On a long-term basis, I think we'll see this ratio move down closer to 20. So right now, silver is looking rather undervalued relative to gold. Four More Years of Obama: The President has been very good for silver prices. 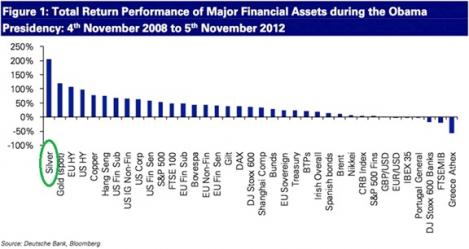 In fact, he was so good, he helped make silver the best-performing major financial asset during his first term. Now that Obama has earned another four years, and Federal Reserve Chairman Ben Bernanke's still in place and relying heavily on the printing press, I'm fully expecting a repeat performance. Thanks, guys, for more of the same. Higher Investment Demand: Physical silver investment demand is growing. Despite a number of existing silver ETFs, the Royal Canadian Mint is launching its own. That has suddenly removed 3 million ounces from the physical market. The Sprott Physical Silver Trust (NYSE: PSLV) is expanding its size as well, likely having bought 7.5 million ounces of silver to accomplish this. That's over 10 million ounces in a single month. Meanwhile, the U.S. Mint has sold more silver coins versus gold coins so far this year than in any since the coin program started. Higher Industrial Demand: Solar panel demand is exploding and silver is used to make them, of which the average panel requires about two thirds of an ounce. Since 2000 the adoption of solar panel technology has meant a 50% annual increase in silver usage each year, going from 1 million ounces in 2002 to 60 million ounces last year, representing nearly 11% of all industrial demand. Adding fuel to the fire, Japan has recently offered to pay utilities three times the price for electricity generated from solar versus conventional methods. Unlike gold, silver has a wide range of industrial uses. 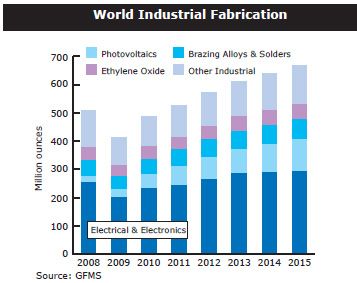 There's currently growing demand from an increasing number of industrial applications, including lighting, electronics, hygiene and medicine, food packaging, and water purification, to name but a few. That's bullish for silver. So for these reasons, as well as silver's historical role as an inflation hedge/monetary asset, look for silver prices to keep rising in the years ahead. That being said, 2013 is likely to be pivotal for the more affordable precious metal. Now that gold has set and may soon surpass its own all-time highs, look for silver to be next. It now looks like $54 is the next price target in silver's relentless and historic climb. Is Gold Still "The Next Greatest Trade Ever"? Sounds very good to me! I think sliver will appricate more than Gold by 2016 @$75.00 to $100.00. & your analysis is very good to know it. Great news on silver. I've been tracking it since 1964 when I was first advised to buy it. I suggest that anyone buying silver to buy the 1996 Silver Eagles if y ou can find them. They only made 3,600,000 of them and it's now difficult to find them in any condition. Buy Them. I think the current price is about $ 69.00 for each coin. Be careful about getting caught up in rarity traps in pseudo-numismatic aspects of collecting silver. One of the safest ways to purchase silver is the lowest price per ounce of easily recognizable silver. "Junk" Pre-1965 Dimes, Quarters, and Half Dollar coins purchased in bulk from reputable dealers have some of the lowest premiums over spot and are easily used in commerce. I had a question actually, I was wondering if you think that the 15 to 1 ratio prior to gold taking off after it obtained the 400 dollar per ounce. Would the precious metals actually reset at a higher ratio of 40 to1 or even 30 to 1…. will we ever see that ratio of 15 to 1again? Based upon your comments above, past recommendations for SLW, SSRI, AUN seem sound for a long time moving forward. Who else would you add to that list now? I own securities in Pan American Silver (PAAS) and had considered selling them because the price continues on a downward trend; however, with everything I am reading, silver should be going up. Should I keep PAAS or would there be a better option for putting my money in silver? I sold all my PAAS when I was able to make a nice profit. I now buy only silver coins and bars. All one ounce weights. This is going to be a better choice when you need to only cash in what you may need. I only keep enough cash in the bank for running the house. Goldsilver.com is where i buy all my silver. Hi Ken, One of the most reputable dealers, and the one that I have used most often, is APMEX. While they sell silver in many forms, one of the MOST recognizable and lowest premium forms is to purchase Pre-1965 U.S. silver coins in dime, quarter, and half-dollar denominations. They are sold in bulk bags of $100, $500, and $1,000 face value which represent approximately 71.5 ozs., 357.5 ozs., and 715 ozs., respectively. Once you have established a large enough position that will allow you to have silver to conduct commerce with if the currency fails, then larger rounds or bars can round out future purchases. I these troubled times you need to find someone you can trust. Without trust, there is fear. And a fearful person will do nothing. The time to act is now, while there is still Silver to be had at a reasonable price. 1 in a 1000 investors know the true value of Silver. Thank you this is great news for us. What happened to April 2012 predictions of $200 oz. for silver simply because China was going to offer it to its people? Similar forecasts followed. Where is the $200 oz.? Want to sell yours, Lanny? That is what I would like to know. There is a marginally better way to get highly recognizable silver in small increments by purchasing bulk bags of Pre-1965 U.S. Coins from reputable dealers, like apmex. The premium is much lower per ounce and, for example, with a dime representing approximately 1/14th of an ounce of silver, if the currency fails, they are an ideal size for conducting commerce. i think that sillver dollars is the way to invest, espicially morgan dollars…….buy all you can! I remember when silver was around $2-5 dollars an ounce. Even now at $32-35 don't forget the spot, by now, cause it has helped my family weather the storm. All sound points but beware of deflation and a weakening dollar. Silver price could collapse before soaring higher when QE goes into overdrive. Mike, as in Mike Maloney of GoldSilver? You sure sound like him! Anyone here who hasn't heard of him, make it a point to do so. so tell me why are the prices not at those levels ???????????????? Good question, Brad. As the worldwide economy fails, there will be far less demand for those other minerals. Because much of the silver that is mined IS a by-product of those more profitable and viable mining operations, as demand for those minerals decreases, the supply of silver will, of course decrease right along with the reduction in mining of those minerals. A few days ago I read that Gold could drop to $750 per oz due to DEFLATION.In fact a good idea to sell off gold in 7 months for the us dollar.Because in 2013 DEFLATION was sure to follow. Now I'm reading that Silver is the front runner in 2013 plus gold also to hit new highs. It's confusing to me which direction I should take.I have been a collector of Gold and Silver now for years in coins.Both Bullion as well as older coins.Morgans and Peace dollars etc.pre 1965 plus newer coins in silver. Burton…Hedge your bets and own both…since you already do. For newcomers, may just want to buy silver only. I just started buying into silver. Buying grams for now so I do not lose big. Any good tips for a newcomer? Been going through APMEX. I've found Provident Metals to be very good. Just bought 20 1oz Mercury Dime replicas that are beautiful proof like quality as well as a couple rolls of pre 64 Roosevelt dimes. Quality and service A++ & very reasonable S&H. If the currency fails, bags of coins will become boat anchors. If you are concerned about what to do to insure your worth into the future you best be able to come up with something essential, like food. I rather suspect substances such as pain medications and distilled or fermented spirits will be very negotiable tender. Agreed! Buy the things now that you would have used the silver to buy later. Stock UP! the marked will discount the certainty before you can get in. Be aware if you loose principal in uncertain times it is an investment sin. Do nothing today. Silver could go down and you will have some boat anchors at least but that is not the target. If you must, go to multiples of options now. In that way you are assured of your down side risk and the up side is wonderful. Hold cash as much as you can and wait to get the hard stuff later with the cash. When the options in silver hit buy hard silver with the profits and principal. The profit insures you a lower hard asset, and your risk is very low. If you do not get this or do not understand this do nothing as this in not for you, if you do not know what I am saying quit now and send me your money now, as loss is in your future. @ Nick M: I have a suggestion for you. If you intend to be smug and/or arrogant, have someone edit your paragraph. It's unintelligible. Ladies and Gentlemen start your engines HFC and bring the truck for some SAND and STTYF!!!!!!!!!!!! What about buying a silver ETF instead of silver coins? I have owned the gold ETF "GLD" in the past in it is very easy to trade, while coins have a big commission and you have to find someone to sell them to. I use the debt to GDP ratio and the total national debt as an indicator of whether to keep buying gold and silver or not. Obviously both are still rising and the monetary base (M1) is still rising also. The fundamentals are still supporting long term silver prices.